Our wonderful couple Amy and Steve came to us with an inspiration photo found in a magazine. Many of our couples do. They see something about the colors, the style, the feel in a photo. We love to help develop their dream from there. When Amy mentioned her southern roots, we knew where we were heading...raw cotton bolls and magnolia...LOVE! Late January in Oregon can provide some interesting weather. The week prior we had snow and lots of rain. The wedding day though proved to have clear skies, even some blue skies! BeckenRidge Vineyard was beautiful in it's winter state. Actually, went perfectly with the day. We love photographers who capture our work in a way that we just cannot! 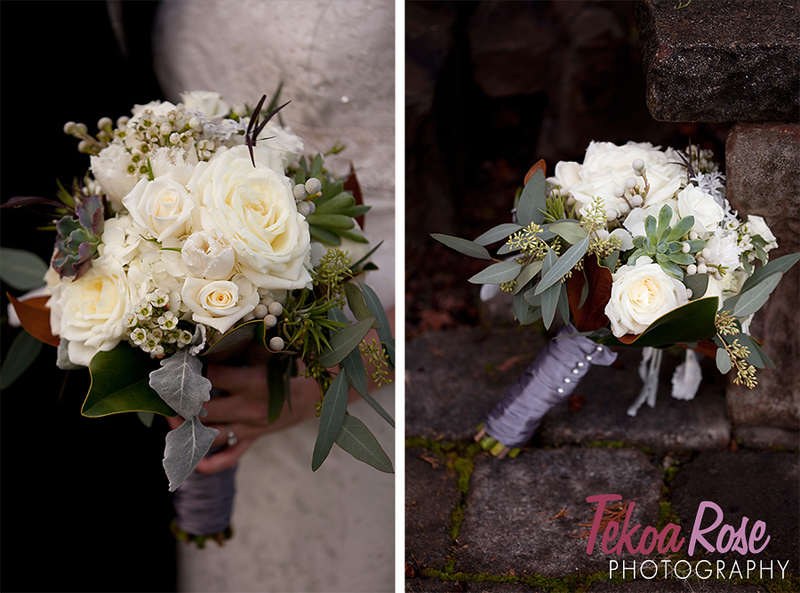 How we love the photographs from Angela of Tekoa Rose Photography! Keep scrolling for more! We love succulents and managed to get a picture of this from the bride's bouquet. The white frilly tulips aren't too bad, either! One of our favorites and not very easy to come by! This bouquet also had air ferns, silver brunia, white wax flower, dusty miller, seeded eucalyptus and southern magnolia! Each Maids bouquet was similar to the bride, minus some of the goodies. We added the raw cotton to their bouquets for some fun accents! The bride chose pewter, cream and white as her colors. 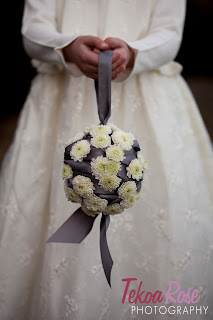 The flower girl orb started with an orb of pewter satin ribbon with the small flower accents. We love how this look worked the pewter into her flowers. Such sweetness! Thanks again Angela for capturing it for us! Small cocktail bistro tables were accented with black cube vases with pewter accents and a fun assortment for flowers. Amy and Steve chose a combination of both tall and low centerpieces for their reception. White hydrangeas provided the base for these pieces. Beautiful seeded eucalyptus, curly willow and southern magnolia finished off the tall pieces. The low centerpieces included some silver brunia and white waxflower. Loved the finished look of the room! We would be remiss in not mentioning our friend Heidi and her wonderful Sweet Dreams Cupcakery! We love our flowers, we also LOVE Heidi and her treats! Oh my...just take a peek..
CONGRATULATIONS to Steve, Amy and Shadow! We loved getting to know you! Happy married life! Gorgeous as always! Love love everything you create..it's pure beauty! I love it! We have RAW COTTON Bolls! In fact, that is all we do!